Film is an illusion created by the scenic coordination of light, space, and movement, which becomes real through projection. In architecture, the interplay between these parameters defines the intensity and effectiveness of the individual spatial perception significantly. They are understood to be integrative components of spatial enactment, their effect being projected through sequences of human motion and unfolded in multilayered ways. Both the Eye Film Institute’s concept and urban implementation are based on an overlay of two creative disciplines which have at their core reality and fiction, illusion and real experience. The building concept becomes the story board, the architecture the scenography. By delivering a dynamic interplay, the building’s assigned role oscillates between acting as the urban scenery’s protagonist and as a dramaturgical element placed in front of a heterogeneous landscape setting. On the interface between land and water, between historic centre and modern development area, the building adopts many faces from each viewpoint, thus finding itself in a constant dialogue with its surroundings. Its radiance overcomes the city’s natural divide and historic lifeline, the IJ river, and is defined by its interaction with the surroundings, its positioning, and geometry. The area’s distinctive communicative effect goes beyond the confines of the building, thus transforming the visit to the Film Institute into a sustained encounter between urban reality and cinematographic fiction. As a multi finctional meeting point, the building’s architectural formulation complies in multiple ways with the responsibility held by a cultural institution of the highest functionality and sustainability. Situated in the privileged riverside area in the heart of Amsterdam, the Film Institute represents the visual landmark of the new Amstrdam Noord quarter. This development area extends over to the former Shell Terrain on the opposite side of the river to the Centraal Station, Amsterdam’s train station. As the international oil company’s former research centre, this area which is situated close to the city centre and along the the busy urban water vein held a sensitive function. It used to be an isolated wasteland, hermetically secured and not accessible to the public. Since the transfer of Delugan Meissl Associated to its new headquarters in the north, this stretch of land has developed into a vital expansion area. Apartments, office buildings, and a functionally disposed infrastructure are supposed to act as a bridge towards the lively quarter on the south bank. The Overhoeks Tower is the only architectural relic that reminds of the area’s former use. This distinctive landmark has been integrated into the Film Institute’s conceptual design idea through formal referencing. Flanked by the attractive river promenade pertaining to the Overhoek spark on the northern IJ shore, the new building absorbs the existing usability qualities into its general architectural concept. 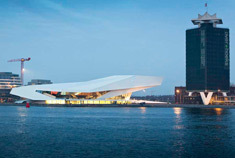 The riverbank’s landscape and the varied movement on the river IJ characterize the the building’s city- facing side turning into essential design factors. The new building generates several urban and interior situations which through their communicative orientation contribute to the urban and social surplus value. Consequently, the Film Institute’s striking and impressive appearance complements the city’s highly qualitative cultural offer and underlines Amsterdam’s role as a world-renowned top- class cultural site. The building can be accessed from several directions in different ways. Whereas on the northern side an access road leads into a public underground parking, on the east-west side a cycle path and a footpath allow the access along the river. A spectacular ride on the traditional urban ferry line gives access to Noord, whereby the slow approach allows for an impressive scenic change before visitors continue their way at their individual speed from the northern embarkation point. The inclusion of the shore strip into the Film Museum’s outer area is articulated as a long-stretched, stepped access ramp that runs parallel to the river and connects directly to the existing promenade where the Overhoeks Tower is situated. This represents a fundamental part of the dramatic composition. Users access the building over a gentle slope and in constant deceleration, whereby the optical changes of the surrounding city view become the centre of attention. While the view over the city and the water widens with increasing height, the physiological effect of the barrier-free access area determines the movement. Spatial density and transparency mount into an exciting atmospheric moment before reaching the building’s interior in an almost imperceptible manner. The dynamic room sequence is clearly recognisable from the building’s general external geometry and it develops on the inside as a coherent spatial and visual succession of single rooms. Aside from the functional assignment, spatial configuration, light incidence, and reference to the local urban structure represent the primary design parameters. Smooth, crystalline surfaces reflect the incoming light in varied ways, thus creating permanent optical changes throughout the day. This effect is also reflected on the building’s exterior through the main design idea of an architectural enactment of movement and light, both crucial parameters of film as a medium. Focused outer references, mainly the extensive southern façade opening, signal the pulsating vivaciousness of its surroundings and of the opposite city centre. They increase both the building’s and the northern shore’s attractivity and appeal. The access through the large southern glass front is defined by an intense optical reference to the outside before the room widens when coming closer to the ticket and information counter. Cloakrooms, offices, and the museum shop can be accessed from here. The way into the foyer which acts as both, a dwelling and distribution area, is defined by lighting, materials and spatial development alongside the glass front. The fluidly laid out, pleasant terrace acts as an extension of this communicative space. At the centre, the open interior unfolds its full dimension, and all internal pathways are integrated into the spatial formulation of this neuralgic zone. The usability concept generates good orientation and unimposing freedom of movement at all points, whereby the foyer represents the exit- and endpoint of any form of use. Tribune-like steps define partly assigned, partly changeable function areas. The exhibition level, projection rooms and the restaurant can be accessed via this room topography. A staircase leads to the lower level where the office area, the cantine, and the film laboratory with an adjacent restauration workshop are situated. It is where the valuable content of the institute’s archive is professionally looked after. Three screening rooms can be accessed at the rear side of the foyer level. In compliance with their function they are designed as condensed and itroverted passages. On the higher level, adjacent to the restaurant, is the gallery area which is Amsterdam’s biggest cohesive exhibition area. An eastwards facing multifunctional room unit – the educational room – can be temporarily added to the exhibition area. The room’s floor-to-ceiling glass opens the view onto the lower entrance area. A generous staircase leads from the entrance of the exhibition area to the upper level and towards the big showroom. This ascent is widely visible from the foyer and it is suited for the effective enactments of special appearances at premiers and other events. The way to the upper level opens the view over the whole room volume. Beside the showroom’s open gallery area this level hosts the most intimate part of the building: the “Room With A View”, a private location for exclusive and secluded receptions. Similar to a painting, a precisely positioned floor-to-ceiling window focuses the view onto the water and the city centre, underlining once more the privileged location of this unique area.